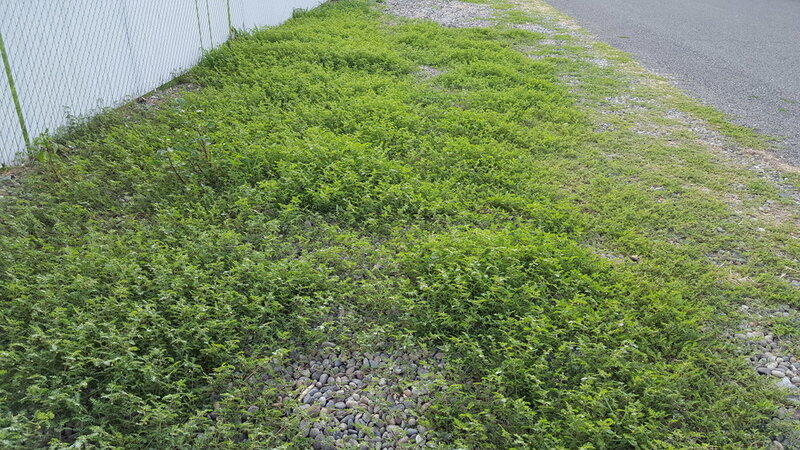 Be on the lookout for Puncturevine, aka "goatheads" or "tackweed." It'll be making its appearance anytime now! Puncturevine produces many burs with sharp spines that can injure humans and animals. It is well known for puncturing bicycle tires and impaling shoes, feet and paws. Diligent hand pulling works best in moist soil, during flowering and can be very effective. However, once the burs begin to develop, you will need a good pair heavy gloves. Learning how to identify puncture vine seedlings is recommended so that you can remove them before they flower. What happens when puncturevine isn't controlled. Image by: Konrad Kauer. Puncturevine tends to grow close to the ground (prostrate) a single plant is like a mat, extending out as far as 6-8 feet. It often grows in disturbed areas such as roadsides and ditch banks, but can also be a problem in irrigated crops. The fruit is a woody burr with sharp, rigid spines. The small, yellow flowers are borne on short stalks at leaf nodes. Punturevine reproduces by seeds contained within the "goathead." Stems and leaves of the plant are covered with hairs. Leaves are mostly 2/17 to 1/5 of an inch (3–5 cm) long when mature, finely divided into three to seven pairs of leaflets, and opposite to one another along the stem. It is a mat-forming, broadleaf plant with an extensive root system. Flowering takes place from March through October. Flowers are bright yellow, about 1/5 to 3/5 of an inch (5–15 mm) in diameter, and are produced singly where the stem and leaf stalk meet. They open only on sunny mornings, except in shady areas.